Stade Ange Casanova is the name of Gazélec Ajaccio’s football ground which is located in Ajaccio on the Mediterranean island of Corsica. Originally built with the name of Stade Mezzavia, it was renamed in 1994 in memory of an ex-director of the club, and today has a capacity of 6,000. Gazélec Ajaccio’s stadium first opened in 1961 under the name of Stade Mazzavia, however it was later named in honour of the club’s former Director, Ange Casanova, on 16th July 1994. Initially consisting of a single stand, the stadium was constructed over the course of a Summer in 1960 by volunteer electricians, gas workers and supporters of the club. 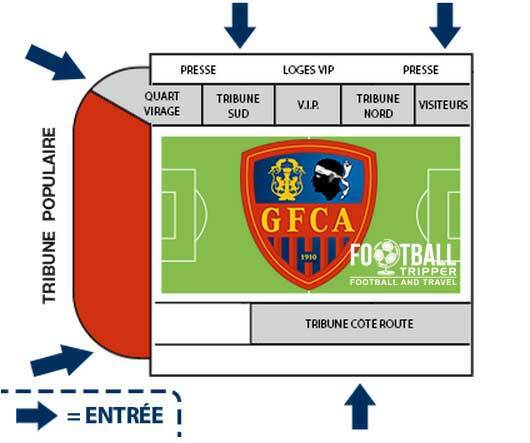 GFC Ajaccio were formed on March 25th 1960 after the merger of two other football clubs bearing the Gazélec name, and thus fans wished to usher in a new era by building a brand new stadium. Previously Ajaccio Corsica Gazélec Club had played at Stade Miniconi, however this required so much renovation work that it was easier to just create a new stadium. The inaugural match was held on 27th August 1961 against CS Louhans-Cuiseaux, but since then the stadium hasn’t really changed too much. The stadium’s capacity peaked during the 1989/1990 season when a crowd of 10,500 attended a Cup game against Olympique de Marseille. During the 2011/2012 season Gazélec managed to reach the semi-finals of the Coupe de France. Defeating the likes of Toulouse, Troyes and Montpellier before succumbing to a 4-nil thrashing by eventual winners Lyon, Ajaccio won The Petit Poucet Plaque which is an award given to the best performing small team. Sadly, the games were hosted at the larger and more modern 10,446 capacity Stade François Coty. Sensing the fan’s disappointment, and boosted by the fact that GFC Ajaccio were promoted to Ligue 2 in 2012, the facilities at Ange Casanova were renovated to bring the stadium into the modern era, as defined by Ligue de Football Professional. This resulted in the installation of new floodlights, a video screen, improved changing rooms, and additional seats which increased the capacity from 2,700 to 4,050.